Station Resorts now owns the land on which Kallisto was to be built. It is unknown if they intend to keep this project. Kallisto is a twin tower luxury high rise condominium project planned for a 4.4-acre site on Sirius Avenue, previous home of the Scandia amusement park. 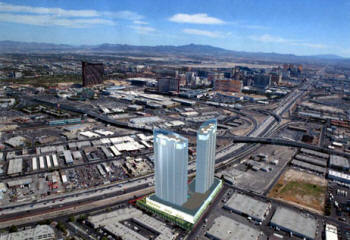 The $550- million project has 700 units in two 50-story towers and will be priced from the low $300,000s to $4 million. 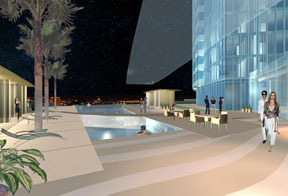 Kallisto will offer four levels of parking with 1,400 spaces, 20,000 square feet of resident oriented retails shops and a 3 acre pool and amenity deck six stories above ground. Floor plans for the one, two and thee bedroom units will range from 800 sq ft to 4,200 sq ft with the two top floors occupied by two story penthouses.